In an ecclesiastical move that defied logic, reason, and history, parents of young children at Church of the Pilgrims have killed off Sunday school. Several weeks ago, Nancy (Elder for Education) and I scheduled a meeting of parents during Buffet, Pilgrims lunch on the first Sunday of the month. Goal: talk through Sunday school and if it's what we need to be doing. Why? Because not many folks were attending. After musing around with the reality of "it takes everything we've got to make it to worship" Pilgrims parents said, "let's just stop." And just like that....a door was opened.....for new ideas. New goal: Weave the kids into already existing things at Pilgrims instead of creating extra stuff. So...it was done. Good-bye learning via the ways of the 1950's. Good-bye to an element of Pilgrim life that didn't fit anymore. Good-bye to the hamster wheel of doing something because we were supposed to be doing it. Hello to bandwidth for me to do something new with the kids and families. I bought two books for each family: Where the Wild Things Are and Brave Irene. I copied 5 stories out of the Family Story Bible by Ralph Milton. These are Gospel stories that focus on one character who needs help. Parents read the books + 1 Biblical story each week with the kids. Then they have a conversation with questions like 1) How could Zacchaeus, Irene and Max be friends? 2) How could they visit each others stories? 3) Can you create a new story with Max, Irene, and Zacchaeus? 4) How could Zacchaeus help Irene? How could he help Max? 5) How are all 3 bold? (Be Bold! Be Salt! Be Light is theme for Lent). Next make a plan to do something---write a new story, have more of a conversation....how do they want to respond to these questions? Execute plan! In the write-up I handed off to parents I also included meal time ritual of candle lighting, sharing high and lows, experiences of being bold and brave. Taking a play out of the playbook from Theresa Cho at St. John's Presbyterian, I rifted her Wreck this Journal format and created a Wreck this Journal for each kid. Putting journals together---what a great job for an intern! Thanks, Emily. I've watched two of my kids work on their Lenten journals. Really amazing to watch energy explode as they realized they could literally wreck the journal. 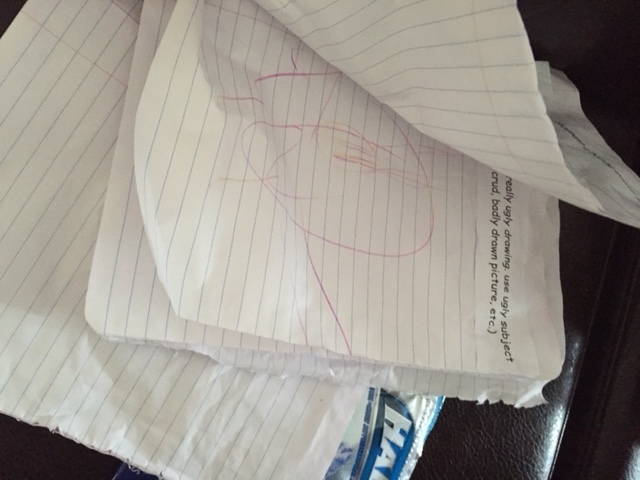 Here is a picture of Maddie's journal and a picture of Ryan's---easy to identify whose is whose. I can't tell you the amount of space I feel in my work. I loved doing the journals. I loved talking with Sabina and having time to create at-home materials. I love not having to think through the details of Sunday school. I've noticed I've slowed down a bit, my brain doesn't feel so full and chaotic. Sunday mornings have been a dream---I have more time to get ready for worship which is it's own labor intensive endeavor at Pilgrims. I feel so much more mindful on Sunday mornings. Less program. More people.